By Steven N. Severinghaus | October 9, 2015 Flies are familiar to all of us. They are best known as the ubiquitous pest of summer: fruit flies swarming on bananas, house flies buzzing against windows, or mosquitoes spoiling an evening picnic. But it wouldn’t be fair to judge all flies by the behaviors of a few pests. The order of flies is huge and diverse, beautiful and colorful, and ecologically important. This crane fly (family Tipulidae) is resting on a leaf, and you can clearly see its slender forewing, with the bulb-tipped haltere sticking out behind it. The halteres swing up and down just like the true wings, and when the fly rotates in flight, a twisting force is exerted on the halteres, which the fly senses with a special organ. 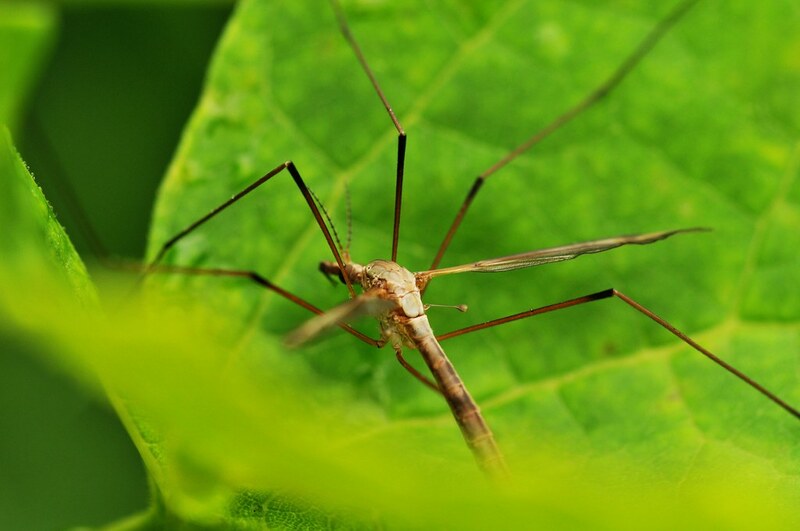 The adult crane fly will have a short life, perhaps just several days. It can’t eat, and its only goal is to find a mate and reproduce. This robber fly (family Asilidae), above left, in the Native Flora Garden, on the other hand, has quite an appetite. Robber flies are voracious predators, feeding primarily on other insects, large and small. You can see how robust its thorax is, and the strong muscles allow it to trap prey in its bristly legs. 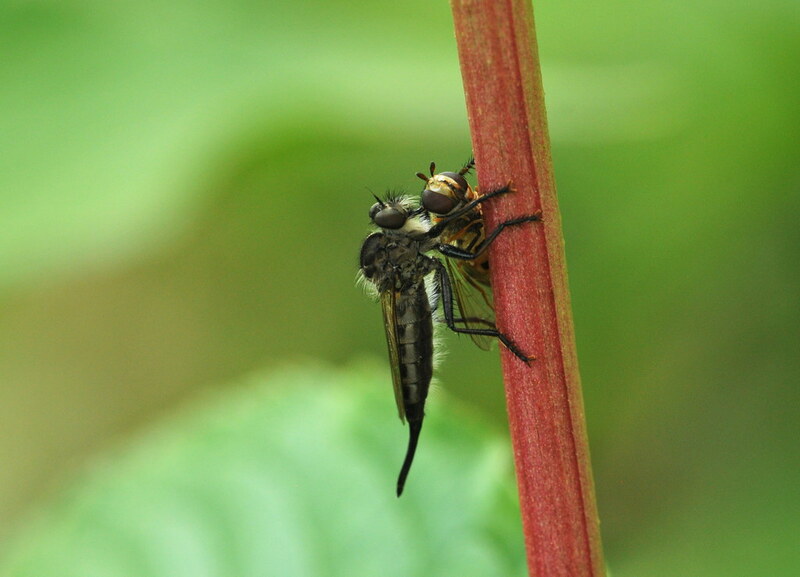 Once this robber fly had captured the hover fly, it pierced it with its hypopharynx to paralyze it and start the digestive process. 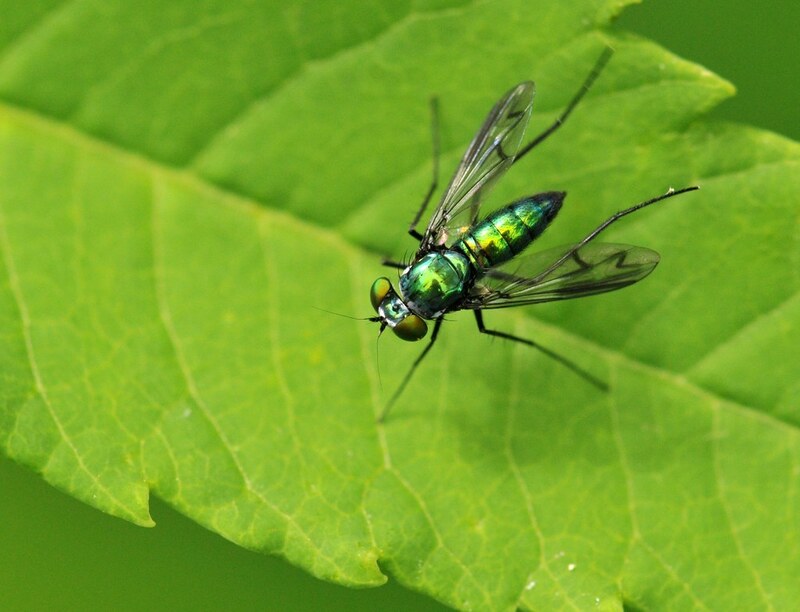 These predatory flies have an important role in controlling the populations of other arthropods. This pretty little insect is a long-legged fly, family Dolichopodidae (genus Condylostylus). These flies are quite small but easy to spot sunning on leaves or railings all around the Garden. Like robber flies, they generally feed on smaller insects. The patterns in the wings are thought to allow individuals of the same species to recognize each other in order to mate. 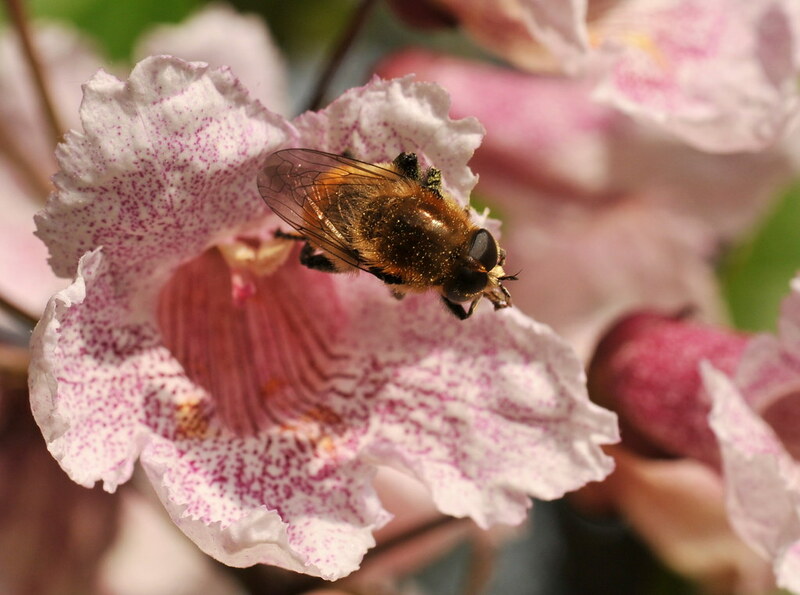 Hover flies (family Syrphidae) are generally easy to recognize, since they often mimic bees in their coloration. This narcissus bulb fly (Merodon equestris) is cleaning itself after a visit to a Manchurian catalpa flower. 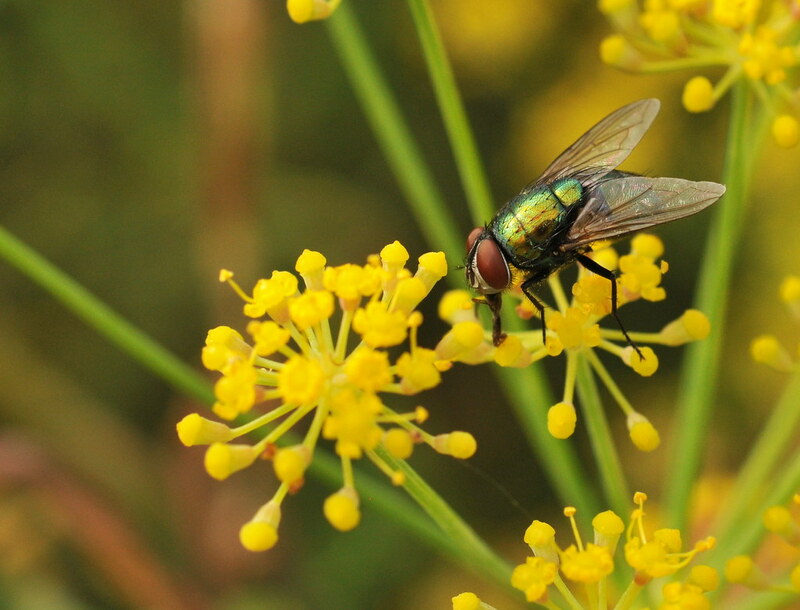 Also known as flower flies, they feed mainly on nectar and pollen and thus are important as pollinators. This particular fly appears to mimic a bumble bee, but many syrphid flies have black and yellow stripes like wasps. In flight, they are easy to distinguish by their ability to hover very precisely. Photo by Steven N. Severinghaus.